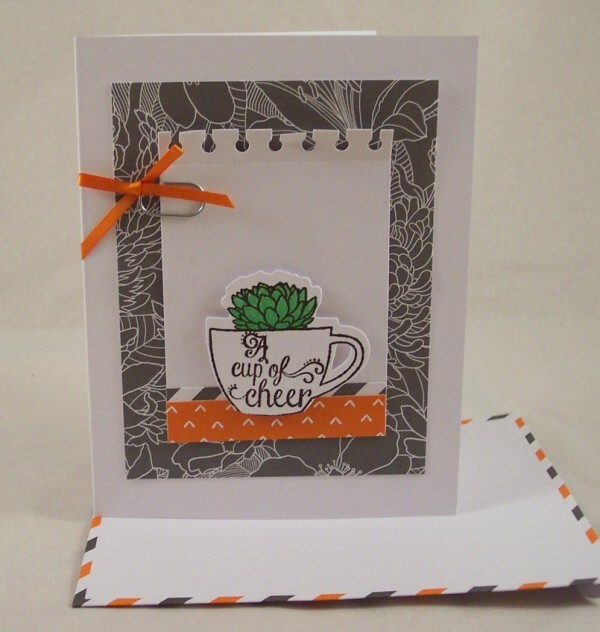 The kit for July includes everything you need to make 8 cards with a tea cup and succulent plant theme. It includes 8 scored cards, 8 envelopes, pattern paper an pattern stickers, paper clips with ribbon, a clear stamp set and adhesive. For my first card, shown above, I followed the directions in the kit for my second card I changed things up a bit adding some matching Stampin’ Up Washi Tape. Or you have a chance to win this months Paper Pumpkin kit! The generous folks over at Stampin’ Up are offering to giveaway a kit to one lucky Craft Gossip reader, simply leave a comment below to be entered. One comment per person, open to US residents only. Giveaway runs from today through 7/26/15. This is a very cute and versatile stamp set; love the sentiments! I’m an avid tea drinker, so I’d absolutely love this set! Thank you for the giveaway! I would love to win this kit! I tried paper pumpkin a year ago and it was fun but I only like the card kits, not the other treat bags and things. Wish there was a way to just get the card kits!!! Thanks! SO cute! I would love to win this kit and to give Paper Pumpkin a try. Thank you! This is an adorable kit. Love the pop of color on the card. I’d love to win this. I’d love to win a kit. Thanks! What a darling card kit! 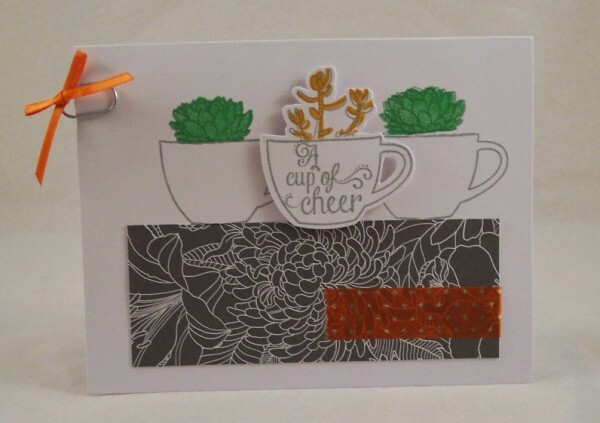 Stampin’ Up is one of my favorites! I love this kit because I drink tea all the time. Thank you for this wonderful crafty giveaway. If I win I will be able to see a kit before I join. Cute stamp!! It would be perfect to send a card to my friend as we are always sharing different teas. That’s such a great set! I love succulents so I’d get a lot of use out of this set. Thank you for such a great giveaway! The PP kits are great, everything you need to comploete a project in a box! This looks like a fun kit. What an adorable and versatile kit! Thanks for the chance to win! So cute- would love to win this! Such a cute kit. I would love to win one to give it a try. That’s a cool kit. I love the little succulent stamp! I love this kit but just found out I need to replace my roof…on a very limited income. I wish I could afford to purchase but sure would love to win!!! Time to start working on my Halloween projects. Would love to have this kit. Nice kit! Would love to win! and teacups. Thank you for the giveaway. This looks like a fun kit! I would love to win it! I have not tried these kits yet and would love to win one. Mahalo for the op to win. I am a new subscriber…i love the cards!!! This kit is just too cute! I love the way each card turned out. Thanks for the chance to win. I just recently got back into stamping and decided to become a Stamping Up demonstrator again. There are so many changes since 2006 or so. I would love to start my return to stamping by winning this great set. Ive already got several ideas for this set already, and because I own a lot of retired SU sets, I have a few that when combined with this kits will make great, fun cards and other items. I pray I win this so I can see them come to fruition. I want to enter to win! Adorable! I would love to win the Paper Pumpkin kit! Blessings to All!